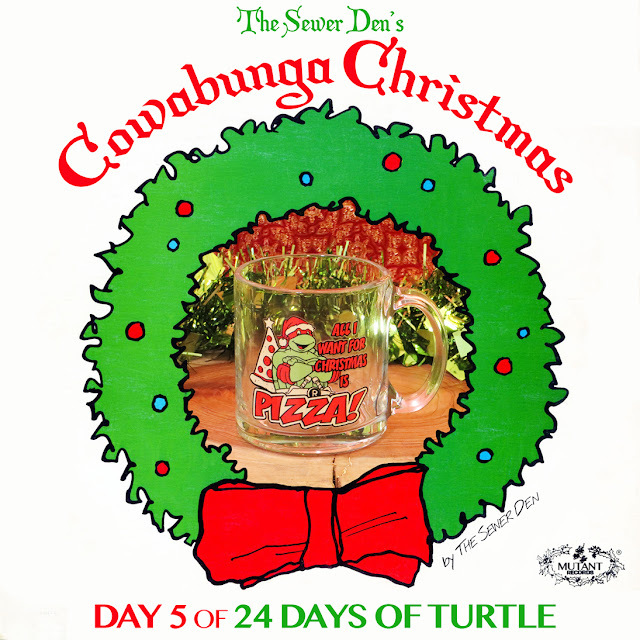 Welcome to Cowabunga Christmas - the 2015 edition of 24 Days of Turtle. The awesome advent calendar features daily holiday-themed treasures from every era of TMNT. Let the countdown 'til Christmas continue with DAY 5! Warm up your ciders, dudes. Get those hot chocolates piping hot, dudettes. 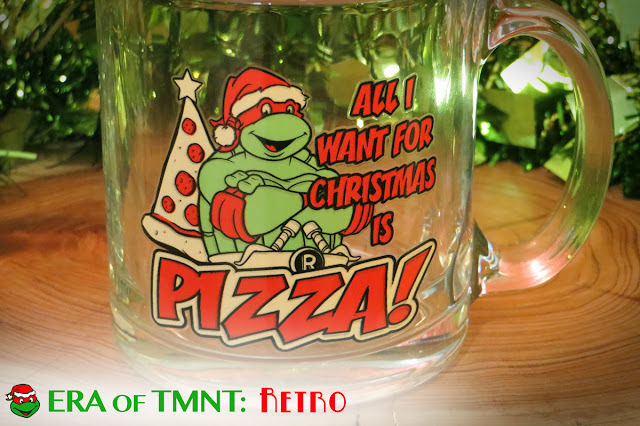 There's no better way to sip your holiday beverage than from the TMNT Christmas Mug. "All I Want For Christmas Is Pizza!" - that's the merry message here. What kid asks Santa for pizza? It's a lame Christmas request, but at least it yields comedic visuals. A massive slice of pizza in the shape of a Christmas tree - festively trimmed with pepperoni ornaments. Can you imagine if that existed? Tasty or terrifying? I'm not putting it on my wish list to find out. The mug itself is pretty durable with thick glass and a weighty handle. As a kid, cereal commercials always used clear glass cups and bowls to show off their products. That stuck with me, and I still love eying foods through their glass containers. I picture myself sipping a tasty, holiday beverage from the Christmas Mug, warmly sitting in front of a cozy fireplace. A gentle snow falling outside, while the soft sound of Christmas music provides a joyous soundtrack. But, the sad truth is that I'll probably be sucking down lukewarm coffee while writing more blog posts. But hey, that's not a very festive visual! The Christmas Mug falls into a classification I refer to as "Retro." It's a recent 2015 creation, but features the Turtles from the original 80s cartoon. Nickelodeon quickly learned there are plenty of adults willing to spend their hard-earned cash on TMNT merchandise. Lucky for us (but not our wallets), seasonal releases, such as this one, are actively sleighing onto store shelves. Does the Christmas Mug make a good gift? Without a doubt. Kids, grownups - everyone loves pizza. And everyone will love this mug. Eating is such a boring chore as a child. But with this mug, it raises the excitement of the experience. Raise a glass to the holiday season - a pepperoni-decorated pizza tree glass! 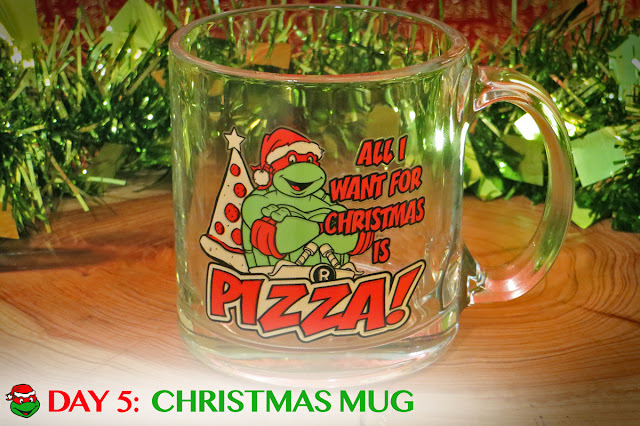 Check back tomorrow for DAY 6 of Cowabunga Christmas! Can't wait until then? Take a trip with the Ghost from Christmas Past to see what The Sewer Den put on display on December 5th in 2013 and 2014.